This post was authored by the Microsoft and Docker teams. 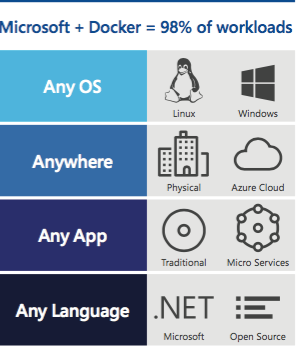 Microsoft and Docker aim to provide a modern platform for developers and IT pros to build, ship, and run any application on-premises, in the cloud, or through service providers across both Windows and Linux operating systems. Together we are bringing container applications across platforms, integrating across our developer tools, the operating system, and cloud infrastructure to provide a seamless experience across the application environment from development to test and production. Whether you host your workloads in private datacenters, public cloud, or hybrid, Microsoft and Docker offer great end-to-end solutions or individual components from the developer’s keyboard to cloud. Azure Container Service provides the simplest way to deploy your container orchestration environment, such as Docker Swarm, so your app teams can deploy their apps more quickly. Windows Server Containers are powered by the same Docker toolchain, so you use the same Docker tooling to build and run those containers as you do your Linux containers and with the tooling you choose including Eclipse, Visual Studio, Jenkins, and Visual Studio Team Service. Windows Server Containers help secure and modernize existing enterprise .NET and line-of-business server applications with little or no code changes. 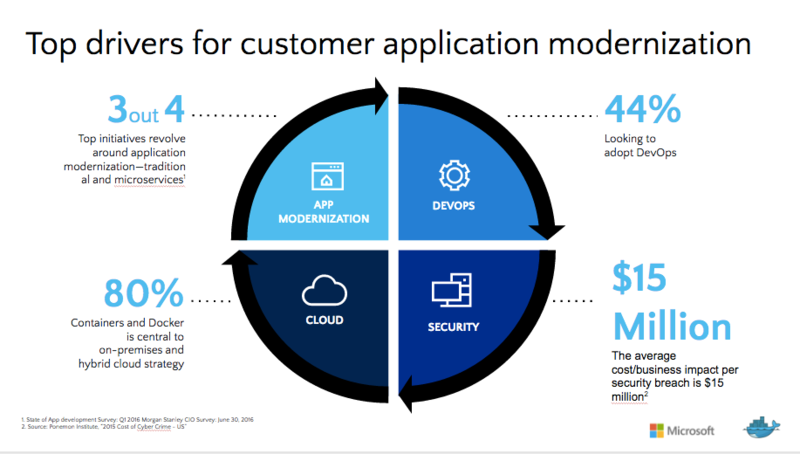 Package existing apps in containers to realize the benefit of a more agile DevOps model, then deploy on-premises, to any cloud, or in a hybrid model. Reduce infrastructure and management costs for those applications, as well. Come visit Docker + Microsoft sessions @ DockerCon, taking place in Austin, TX from April 17th –20th. Learn how to modernize traditional applications as well as learn new technologies to help you build your next great application. You’ll learn about customer success stories on how they were able to achieve ROI targets and up to 80% cost savings through infrastructure consolidation and operational efficiencies with Docker Enterprise Edition (EE) and Azure. There will also be hands-on labs for you to experience Docker on Windows. We’ll provision a Docker environment for you in Azure, and provide self-paced learning guides. You can learn more by reading Elton Stoneman’s blog on Docker + Microsoft sessions at DockerCon, from modernizing traditional apps like .NET to building new Windows Server Container apps.